Maybe I am lucky but my OH treat the garden like the washing machine....leaves well alone and claims he knows nothing about it. Just like the Dyson, iron, kettle descaler, floor mop (!!!) I could go on.......................................................................................on the domestic front, if ignorance is bliss then he is ecstatic ! Lol - there is that! When I broke my ankle the house was vacuumed once - by my daughter (and that was only the kitchen where he'd smashed something and it needed cleaning up) then it wasn't done until I was walking round in my moon boot - even then I wasn't supposed to do that so soon! I love raking and mowing the lawn. I have one of those £30 hand mowers and am always happy when I'm raking up the thatch and then mowing all the straggly bits of grass and weed. I never try to do the lawn in one go. Just a bit every day, back and forth. 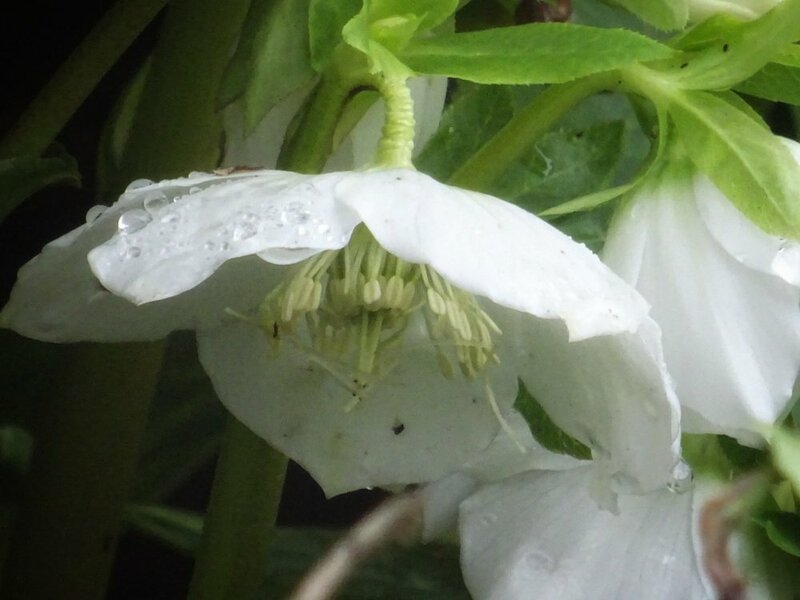 I have one hellebore and I love it to bits. It's something else that makes me happy. I have one but it has never done anything - maybe I need to move it. I think Hellebore are my favourite winter/ early spring plants. I know they’ll keep blooming until the magnolia, clematis amandine and all the other lovely flowering plants are in bloom. I was feeling really lazy when I planted this one and just plonked it in a gap. For the first few years it was quite puny but always had a few flowers. This year it looks very happy. LOVE, LOVE the avatar. PL. How perfectly, wonderfully gorgeous! I want to grow dahlias this year (never had them before due to my hatred of earwigs) - what do people think about seeds vs tubers vs cuttings (which would have to be bought)? I think I’d go for tubers. My problem is the slugs and snails we have here. I can only really grow dahlias in pots where I can keep a better eye out for the slimy menaces. The year before last I spent a fortune on dahlia tubers and never had one flower, slugs and snails ate them all. I had wanted to grow them as I remembered mum and dad growing them when I was a child. Last year I used some wool pellet things and copper rings. Some got eaten but I did have some lovely flowers too. I grew them in pots. I had planned on planting them out into the garden but I was too worried about them being eaten after all my hard work protecting them in their early days. Hello, can I join in please, a thread about gardening sounds great. I'm starting a new garden (all grass at the moment), Im making it up as I go along. Ive got a veg patch area and a bare flower bed I'm hoping to grow cut flowers in and a few pots that I have planted up so will see how they go this year. The more the merrier! All trials and tribulations welcome - we learn by our mistakes! Tomorrow I get a delivery by the compost man! Finally getting to grips with things! Today off to Taunton to visit Oak Apple Frames to see what they do - outbuilding here is a wreck and OH had to nail the roof on to stop it blowing off in one of the first storms we had here! Potato day for our nearest place is Williton, near Taunton on Sunday. will see﻿ ﻿how they go this ﻿y﻿ea﻿r﻿. 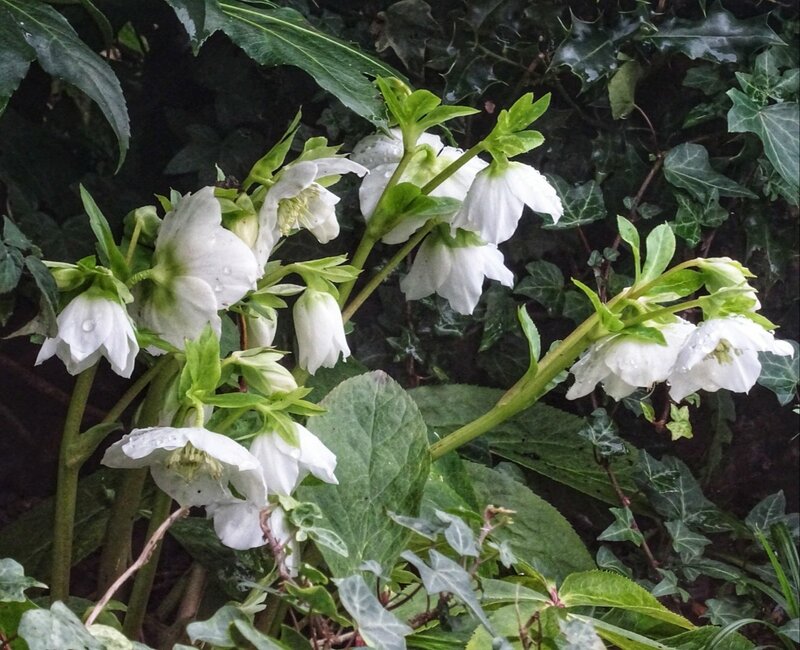 All a bit late in the day I'm afraid, but I just wanted to say that those hellebores look divine, my Mum has started cutting back the leaves on hers when the plant is in flower, to show off the blooms a bit. I have had no luck growing those bedding type cyclamen outdoors. As soon as it rains, the petals sink and the whole thing becomes very depressing. 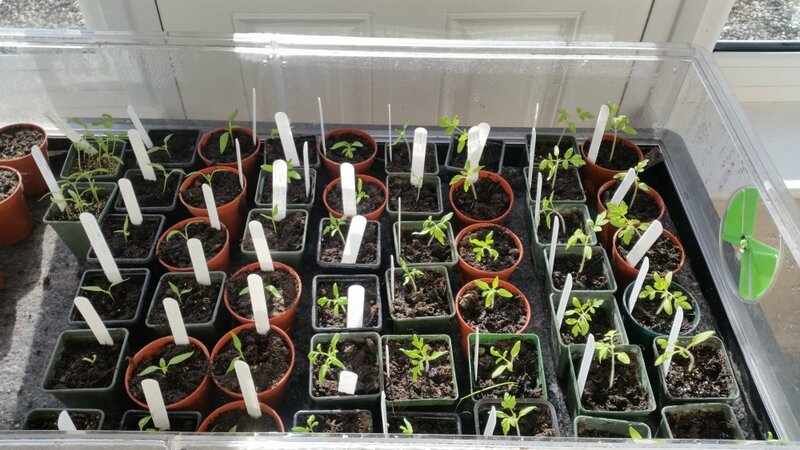 So, for the past 10 years or so I have bought 3 or 5 healthy small plants popped them in nice terracotta or other pots and kept them in a cool glass porch over the winter months, watering them sparingly. They have always flowered amazingly if you deadhead and choose ones with many buds in the first place. You can even find delicately scented ones if you sniff carefully! Because they are cheap I then ditch them with a clear conscience once they get to the end of their lives, I don't bother drying the coums and trying to get them going again, because it never works for me. Onto dahlias. I absolutely love dahlias but I am not good at growing them, so perhaps you should do the opposite of me! In the UK I have tried tubers (in clay soil) which gave rise to strong plants but few blooms. Then I tried them in pots, and got weedy plants and even fewer blooms, although I was able to take cuttings (in conservatory), so I got more feeble plants than I started out with. In no case did I feed them, perhaps that is where I went wrong. The best place I ever saw dahlias was in Victoria, Australia, where we drove for a couple of hours to go to a dahlia farm. We paid $3 and wandered up and down rows of fabulousness. I have also seen great dahlias close to my old house at a farm shop, where they were also grown in rows, in the ground, for cutting and selling in the shop. My neighbour here in Portugal also grows them well. I am tempted to think you need to grow them like a crop, a row of runners or something, where you pay some attention to them, and hold them up by poles and strings, rather than informally. I grew dahlias from seed last year, in Portugal, and I have a friend in the UK who swears by them. However, I found the blooms rather puny and ordinary, nothing like a big, fat dahlia should be, in my opinion. BTW I went to a class at Sarah Raven's many years ago and as I lived close by I explained how I couldn't overwinter my tubers (they rotted) and she said she managed to save hers by lots of mulch, which still didn't work for me. I then said I was trying gladioli instead, and she said they were even worse! 😂 oh dear Daphne - that’s a bit of a tale of woe regarding the dahlias. Were the gladioli any better? I have a few of those and they do OK but not great. I have reasonable soil - neither clay nor sandy - so hopefully should be OK on that score. I’ll just try them and see how I get on. I bought two packs of zinnia seeds for 29p each from Lidl and then read that they only do well in really good summers, so I might try them in the greenhouse. Oh that wasn't very helpful response! I thought she was supposed to help you not put you off! My grandmother grew gladdies and she always had a super show. She had this huge old vase that she used to cut them and stand them in and still had plenty in the garden! She lived in the New Forest and her soil was incredibly stony! She used local farm manure on the veg and pony poo on the roses. I don't remember her mulching flowers at all! She also had chrysanths and very tall dahlias - the only one I remember there was a pretty purple one with white edges - huge blooms! Neither did well on my clay but the chrysanths were lovely. Lovely to see people have plants growing already. Some of my bulbs (in the pots) are coming up too early so not sure Im going to get the long lasting flower selection I was hoping for.